Jacket features pockets and peter pan style collars. Added textures for front, cuffs, and collars. 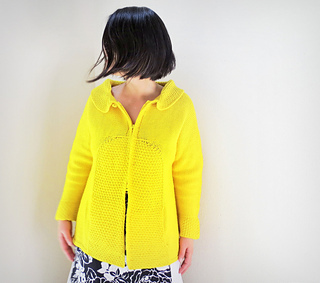 35 (38, 42, 45, 52, 55), sizes are based on chest measurements of finished sweater in inches. 2 to 6 inches / 5 to 15 cm positive ease recommended. Sweater is worked from bottom up, flat in one piece. Divide front and back at underarm. Add on sleeves toeither side at underarm to work horizontally from cuff to cuff. Graft front to back at shoulder/outer sleeve line. pick up stitches for collars.